Susan Pieper will retire after 22 years of service to the Paulding County Carnegie Library and its patrons. Photo courtesy of the library. PAULDING – A retirement reception for Susan Pieper is planned for Tuesday, April 16 from 2:30-6:30 p.m. She has been library director since 1997. The public is invited to the event, in the main Carnegie library, 205 S. Main St. in Paulding. 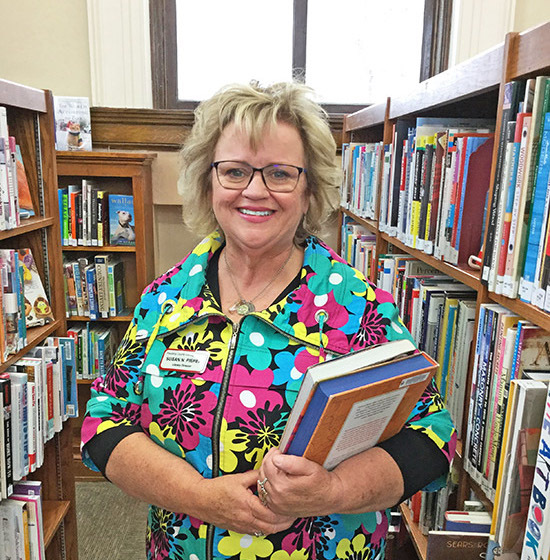 PAULDING – After 22 years as the director of the Paulding County Carnegie Library, Susan Hill Pieper is retiring. However, her legacy both at the library and in the community is well-cemented into the future. During her lengthy tenure, Pieper was able to implement and administer many services at the library. In 2000, she oversaw the opening of the Oakwood branch, which has been a great resource for that community. 2001 saw the library receive a Computer Lab grant from the Bill and Melinda Gates Foundation. The library was awarded several computers for a training lab, along with an instructor computer and projector. Also awarded during Pieper’s stint was a Library Services Technology Act funding, helping the library migrate to Polaris online automation. “These new technologies opened a world of information to citizens, providing them with workforce development opportunities as well as ways to engage in social media and the online world,” said Pieper. Other accomplishments include a Bookmobile created in 2011, which provides library service to isolated county locations, including nursing homes, Head Start programs and preschools. Also, in 2016 the library system received a $50,000 grant from the Ann Sherry Foundation to add a 3-D printer, sewing machines, microscopes, robotics, textile arts resources, and building sets to all locations. As with anyone who has worked at one location for many years, Pieper has a few favorite career highlights. Pieper also enjoyed traveling throughout Ohio, training other library staffs throughout the state to work with the Ohio Public Library Information Network (OPLIN), a computer database. Technology is one area in which Pieper has seen the most change in her years at the library. With all the technological advances in society, some individuals may think libraries are becoming obsolete. Pieper however, feels there are some areas in which technology cannot replace the role of a library. The library staff also assists Paulding County citizens in finding jobs. Literacy development resources are offered, as is homework help for children. The county libraries also distribute “Diaper Chapters” to new parents, which address the importance of reading aloud to infants and young children. It seems Paulding County understands the value of its libraries. Over 85,900 people visited Paulding County’s libraries and borrowed over 200,000 items in 2018. There are over 15,500 active card-holders, and the public library computers were used over 12,200 times, with over 14,100 eMaterials borrowed. Although Pieper is retiring, she still has many future goals she would like to see come to fruition for the library. One such goal is to expand the main library to include a community meeting room, so the library has the capability to host educational opportunities, public forums, author visits, and other events. Another goal is to open a branch in Grover Hill, and eventually one in Cecil. Pieper credits the dedicated teams of library professionals she worked with over the past several years with helping her realize so many of her goals. She has many plans for retirement, including spending time on her small farm working with her horse, gardening, and expanding her butterfly station, traveling with her husband, and just seeing what each day brings. Pieper offered advice to anyone considering a career in library science. The first step is to pursue an undergraduate degree, then obtain a master’s in library science.